DS Polarium (USA) "Puzzle Mode" in 06:57.68 by partyboy1a. Polarium is a puzzle game developed by Mitchell Corporation. Players use a stylus to draw lines on the touch screen of the DS, flipping black and white tiles to clear puzzles. 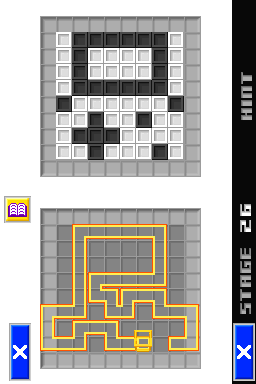 Among the various modes are Challenge, which is similar to Tetris, and Puzzle, where the player must figure out how to clear complex puzzles in one continuous stroke. In this run, partyboy1a plays through Puzzle Mode, using precise stylus movement to clear all 100 puzzles in just under 7 minutes.